We only offer Apple approved repairs. This means we always use genuine Apple parts and our repairs won't void your warranty. Not sure what's wrong with your phone? Pop in-store and we'll diagnose the fault for free. Manufacturer approved repairs from our expert service partner. Why get your phone repaired by us? We are an Apple Authorised Service Provider. Broken phone? Don't be broken-hearted. Our technicians are Apple-trained, which means you can trust us with all your Apple devices. We use genuine parts to deliver repairs that are Apple-certified. And if it's good enough for them, it's good enough for us. If anything goes wrong with your phone, you can relax - your device is in safe hands. Select your device and we will tell you how much your repairs will cost and where you can get the repairs done at one of the 14 Apple authorised repair locations across the UK. Our technicians are Apple-trained, so you can trust us with all your Apple devices. We use genuine Apple parts to deliver Apple-certified repairs. And only Apple-certified repairs are backed by Apple. *12 month repair guarantee is provided by Team Knowhow & Carphone Warehouse. When your phone is damaged a repair isn't your only option. We may be able to offer you an early upgrade and/or trade-in, even if it's damaged. Check with us to find out if you are eligible for an early upgrade on our upgrade checker. Even if your phone is damaged you can still trade your phone in. Find out how much your handset is worth. 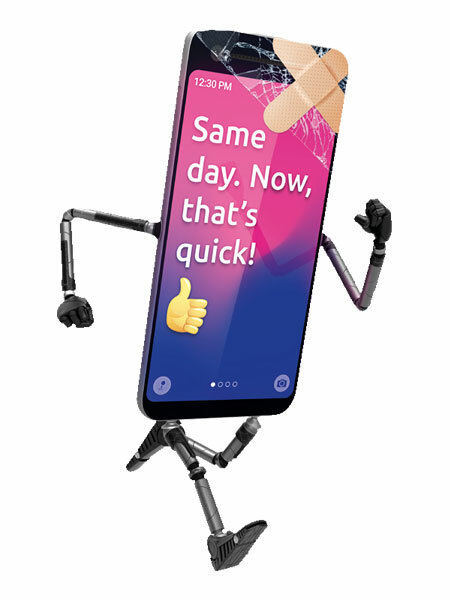 Depending on the make and model of your phone our Repair & Service Centres will usually be able to fix your phone on-site, usually on the same day providing the required part is available in store. Some models do need to be sent away to be repaired and this can take several days. You don't have to have purchased your mobile phone from us. We fix most models of iPhone, on all networks, even if they weren't bought from Carphone Warehouse. If you haven't bought your phone from us, remember to bring in your receipt.